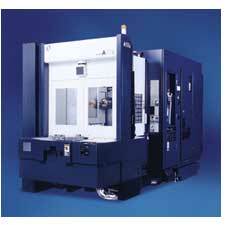 In the mid-1980s, Makino introduced the MC40, a horizontal machining center (HMC) that offered a glimpse of the high speed machining advancements. Makino then made a further leap forward in 1989 with the development of the A55, the first of its A-Series machine line that would drive the metalcutting industry for the next 15 years. The A55 evolved into the A55-Plus in 1993, the A55 Delta in 1997 and the A55E in 2000. Each iteration of this revolutionary machine tool line incorporated new features and dramatically enhanced production capabilities and reliability that would prove to dictate and dominate North American and global HMC marketplace in areas such as production machining, aerospace manufacturing and die/mold production. Over 2,000 A-Series machines were manufactured and sold worldwide, ending the market dominance of traditional box-way and geared-head machines. Competitors took notice, and the entire global horizontal machining market changed to match the technological lead created by the A-Series. Machining and process advancements designed into and achieved from utilization of the A-Series machines brought cycle time enhancement, production efficiency and part quality performance to a whole new level of prominence and achievability. The metric of reducing "out-of-cut time" as an element to improving machining speed was also created from as well as driven by the A-Series performance. 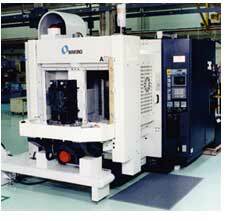 In 2002, Makino used the key learnings from these A-Series advancements to develop the a51, the newest generation of HMC technology. This simplified, advanced and affordable machine has allowed Makino to continue to serve the premium OEM machine tool buyer while broadening machine tool offerings to smaller, more cost-driven tier-level machining operations that continue to expand the market. The 1-Series line has carried theA-Series legacy forward to provide even greater value and performance for existing customers, as well as leading a significant market expansion into new customer areas. The tremendous growth of the 1-Series product line has since garnered Makino a dominant share of the 400 and 500 millimeter HMC market. This product development has led to the end of a brilliant chapter in Makino product history, as the smaller end of the MakinoA-Series line — the A55E, A66E and A77E — are being replaced by these new 1-Series machines. The A88E, A99E, and A100E product lines, as well as the A66E-5X (5-axis) machines, will continue to round out the Makino HMC product line. Makino engineers took all of their experience from the A-Series to create the more productive, reliable and better positioned 1-Series product line. These advancements and continuous improvements have generated the newest, most reliable platform yet in horizontal machining, ideally suited to meet the demands and needs of the parts production marketplace. The technology in the A-Series was truly ahead of its time, and created a whole new direction for horizontal machining. The technology was a huge leap forward from conventional machines, and there was simply no other machine like it. As previously noted, the A-Series HMC changed the marketplace by creating a measured focus on the elimination of non-value added time. This alone reduced machine cycle times by 20 to 40 percent depending upon the part and material. Makino first advocated this leading concept of a machine tool spending too much time in the production cycle changing tools and moving from one point of part to another. 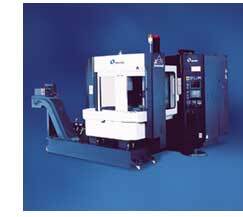 The A-Series machine helped Makino create, advance and refine the now common theory of "out-of-cut time." Other major technological assets of the A-Series HMC were that it had both the capability for quickly changing pallets as well as a higher speed, 14,000 rpm spindle that cut up to 2,000 ipm. Later advancement brought about a 20,000 rpm spindle for even faster metal removal, an unheard of capability at that time. 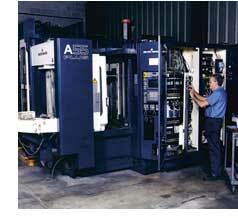 A-Series machines created and focused on a multiple-niche market, throughout all industries. Any company demanding and needing high-speed and high-reliability machining with extraordinary thermal stability performance found it in the A-Series. Customer needs continue to change, especially as the production market has evolved from the dedicated transfer line process used by many OEMs to a flexible and lean tier-level, production-based process. And the 1-Series line technology has simply proven to be a better choice for many production machining, tier-level part operations. Makino has achieved significant and impressive market share growth over the last three years with the new 1-Series product. This machine line has established a superior reputation for performance and reliability, and continues to evolve into even greater performance capabilities that best meet market/customer needs. The 1-Series line has carried the A-Series legacy forward to provide even greater value and performance for existing customers, as well as leading a significant market expansion into new customer areas. The advancements have become staples for utilizing these HMCs in cell configuration and lean manufacturing, allowing the 1-Series machine to become the dominant machine in the market. Machine reliability is more important than ever, as equipment is often required to operate 24/7. Backup machine capacity is constrained by the availability of capital and virtually eliminated from any formula of success for a tier-level supplier. Flexibility, less complex operation, maximum performance and speed are 1-Series assets. And the concept of Takt Time has grown in importance, even beyond that of machine speed and cycle times, as customers focus on JIT (just-in-time) orchestration to reduce work in progress (WIP) and inventory costs. Machine reliability is more important than ever, as equipment is often required to operate 24/7. The reliability and simplicity of the 1-Series is ideal for this new environment. While material costs are the most difficult expenses for a production shop to control, reliability is actually a paramount consideration as these companies strive to deliver parts when the customer needs them in the correct quantities – without the former luxury of excess capacity. The focused effort on design simplicity with the 1-Series enhances that reliability. A-Series machines earned a reliability tag for Makino that the 1-Series is enhancing, as the 1-Series has proven to be 30 percent more reliable than even the A-Series. This is based upon warranty cost monitoring and lower customer maintenance costs, as this newer, streamlined and simplistic design technology is easier to repair and to replace necessary components. As an example, the 1-series has significantly reduced components and moving parts in key areas of technological enhancement, such as in the tool magazine and ATC (automatic tool changer) design. There are simply less things to wear out, and less toll on machine components such as newly designed way covers. One of the highest traditional maintenance costs on an HMC is that of telescoping way covers, due to constant sliding surfaces that bind over time due to metal chips, higher rapid rates, contaminants and coolant. This maintenance concern is eliminated with 1-Series, as the machine primarily has one-piece way covers, which were constructed and designed to eliminate risk and improve reliability. With a global economy financially driving operations in the U.S. and North America due to foreign competitive pressures, manufacturers need to continue to lower costs to stay competitive. While foreign labor costs cannot be broached, advanced technology performance output can allow domestic companies to compete against foreign operations. Movements such as lean manufacturing are fundamental concepts that allow tier-level operations to eliminate waste and cost in the part production process. And the supply chain continues to be driven lower, as OEM customers cannot afford to invest or produce these parts themselves, and are now contracting more functions out to tier-level suppliers due to lower operation costs. 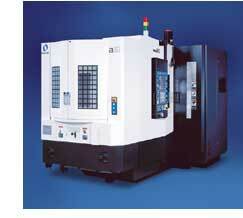 Such Makino enhancements as the Pro 5 controller will continue to lower overall manufacturing process time and cost. Owners of tier-level production shops often cannot invest in technology until a contract is secured. They need to minimize speculation and risk as well as lead time in acquiring capital equipment. Makino has developed affordable, flexible machinery with the 1-Series and at the same time has developed accompanying processes to more rapidly respond to machine delivery requisites. In the past, parts were primarily produced in batches. OEMs were paying higher production costs for this type of volume and inventory backlog, and/or tier-level suppliers were reducing their margins by buying more inventory or overproducing in order to manage the inventory/work/backlog process flow. As more companies are producing parts at lower volumes, the need for rapid start-up and quickly tooling the machines in order to immediately begin production has become even more significant. This risk is eliminated with 1-Series, as Makino can deliver them quickly, and they are more flexible in use when acquired, which further minimizes the risk of advanced investment and acquisition. While some markets such as aerospace machining will need larger A-Series equipment because of the required large stroke and work zone, the 1-Series has become the machine for any size operation to invest in and utilize. Nearly 80 percent of the U.S. and North American market can use the 1-Series technology for a majority of its production from 400 mm to 630 mm. The continuing advancements in this machine line can help tier-level suppliers be even more competitive. Such Makino enhancements as the Pro 5 controller will continue to lower overall manufacturing process time and cost. Enhanced network capability, higher connectivity, editing capability, more intelligence, better/stronger maintenance diagnostics on the 1-Series machines will also help tier-level production machinery suppliers achieve better financial results. The compact size and footprint of the 1-Series takes up 25 percent less space than many comparable HMCs. At the same time, it produces parts faster and thus lowers the level of investment while increasing the output per square foot. Makino is already making evolutionary additions to the 1-Series line to further advance the machining technology of this platform. Makino’s Super High Torque spindle capabilities and the development of the a81M are being used to achieve new levels of productivity in the machining of compacted graphite iron (CGI) in the diesel engine market. And the process capabilities of the 1-Series make it a perfect solution for automation and integration cells in the lean production of hundreds of thousands of parts per year. The 1-Series is now the Makino standard for productivity, with an ability to serve a broader market base than ever before. Such a versatile HMC as the 1-Series will continue to take machining to new levels, with plans pending to expand this line even further.